Does Your Customer Service Need an Attitude Adjustment? Yes, education is important for treating and caring for your patients, but there is one more thing that can make all the difference: customer service. And, this doesn’t just mean the front office staff—it means the dentist, too! Being a dentist requires extensive training, but the attributes valued most by patients when rating and reviewing their doctors is customer service, which is not taught in dental school. When your patients are leaving reviews, you want them to remember each member’s name. Adding that personal touch helps your patients feel comfortable and wanting to return to your practice. Imagine yourself in the dental chair. How would you like your dentist to treat you? What about if your family member was visiting the dentist? Treat your patients how you would like to be treated if the roles were reversed. The dental office is not like working in retail, but customer service should still be at the top of your list. The front office staff should be pleasant and smiling when they greet the patient—after all, they are the first people you see when entering the office. Make sure your front office staff is educated on services, protocol and even miscellaneous topics so they can properly address a patient’s concerns or questions. The more your staff knows and understands the better service they can offer your patients. Next, your dental hygienist or dental assistant should also be knowledgeable in all areas of your practice and the services offered—their skills and knowledge are a reflection on you. Make sure they are educated in dental sleep medicine and other areas of importance so they can answer any questions the patient might have. After the front office staff, the hygienist or dental assistant are seen next and make an impression before they even meet you, the dentist. Greet the patient with a smile, ask how their day is—get to know your patient and they will feel more comfortable. As for the dentist, you are the face of your practice. Get to know your patients and their individual needs and conditions. By getting to know your patients and understanding them, you can create patients for life. Help your patients get to know you and how knowledgeable you are in dental sleep medicine and other dental areas. Once they know you and the services you offer, they will be more prone to share their experiences on the Internet. Patients continue to rely more and more on online ratings and reviews. From Google to Yelp, review sites are aplenty. And when a person is searching for a new dental office they will often resort to reviews and ratings to see what others are saying. If your patients are leaving reviews, and good ones, the chance of getting new patients increases significantly. The appearance of positive words outnumbers negative words three to one—that’s a lot! When negative reviews were found, the common complaints seemed to be about rudeness or feeling rushed. But more people noted their dentists were compassionate, friendly, and knowledgeable—keep that up! Contact Dr. Mayoor Patel to learn more about each team member’s role in the dental office and how you can continue to provide your patients with quality service they will want to come back to. In this difficult economy, standing out among other dentists is a must. And right now dental sleep medicine is in! By being able to offer dental sleep medicine in your practice, you will be the real winner. Dental sleep medicine allows you to share with patients and potential patients that your office has a new unique and essential service to offer. Once you offer dental sleep medicine services, it is your job to inform your community of your new services. Not many people are aware that dental sleep medicine exists or how a dentist can help in the treatment of sleep apnea. It is your job to create a buzz about it. When asked about sleep apnea diagnosis and treatment, how comfortable are you with the answers? There are currently more than 50 million people who suffer from sleep apnea, meaning there is a greater need for public awareness of this potentially deadly condition. As a dentist offering services in dental sleep medicine, it is important for you to educate your patients on sleep apnea and how important treatment is. Think about strokes, heart attacks and diabetes—your patients can benefit from knowing the risk associated with untreated sleep apnea. The more buzz you create, the more your patients will make treatment a priority. As a dentist it is vital that you understand and are comfortable in dental sleep apnea, but it is also important for your staff as well. Once you have received the necessary education, teach your staff about their roles and suggest they completed educational classes, too. The more you and your dental team know about dental sleep medicine, the better prepared you will be to provide your patients with proper treatment. And with education comes knowledge and trust. Once a patient likes, trusts, and believes in you and your team, you have created a patient for life. 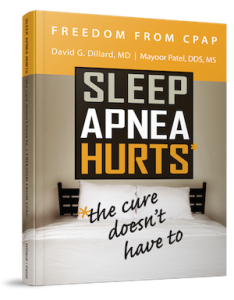 Contact Dr. Mayoor Patel to learn more about Dental Sleep Medicine, and where to complete continuing education. There are many continuing education classes available to learn more about dental sleep medicine, but not all classes are created equal. To further improve your understanding and ability to providing dental sleep medicine services at your dental practice, Dr. Mayoor Patel is pleased to offer an online mentoring program. Your sleep coach is available to help you each step of the way, and they will be available to guide you and your staff during the process of implementing dental sleep medicine within your dental practice. In order to move forward with your career, it is best to utilize your sleep coach as often as needed. You will be provided appropriate guidance in how to develop and maintain your dental sleep medicine practice. If you find you are experiencing a problem and don’t know how to solve it, talk to your sleep coach—that is what they are there for. Another important aspect of the mentoring program is the availability of weekly phone calls. You may not think these phone calls are important, but they are vital to the success of your dental practice. Utilize this time to speak with your sleep coach and ask any questions you might have. It even gives you an opportunity to talk with your sleep coach about office staff issues that might be related to their needs and other areas that need attention in order to succeed within your office. Remember, your sleep coach is your go-to expert in dental sleep medicine and will be available every step of the way. In conjunction with Nierman Practice Management, Dr. Mayoor Patel hopes that you will take advantage of this unique opportunity to further advance your dental practice in the field of dental sleep medicine. Call 1-800-879-6468 to speak to a Nierman Education & Training Consultant for more information on this remote mentoring program. We have touched base on sleep apnea and your role as a dentist, but what about craniofacial pain and TMD treatment? As a dentist you hold an important role in both areas. Jaw pain is not just stress, it can be a more problematic than just that. When a patient experiences pain in the jaw and muscles of the face and neck, it might be TMD. If that is the case, as a dentist what is your role? As a dentist it is your duty to identify problems with your patients. If your patient visits your office complaining of jaw pain, face pain or neck pain, it doesn’t just mean they are suffering from stress—it can be a lot more than that. Identifying the sources of the craniofacial or temporomandibular joint pain is important in providing a treatment solution for pain relief. By understanding the source of pain and if it is dental related, you can offer an appropriate solution to eliminate or lessen the discomfort. Often times, oral appliance therapy is just what your patient might need. Treatments will be tailored to each patient’s individual symptoms and contributing factors. It may be difficult to resolve and treatment focuses on management of the symptoms and restoring function. Simple treatment to relieve the discomfort and restore proper functioning is often all that is needed. Typically, a conservative treatment, such as oral appliance therapy, is recommended because it causes no permanent changes in the structure. Contact Dr. Mayoor Patel for more information on craniofacial pain and TMD for a better understanding of how to properly care for your patients.